· The most important concept in synecology is that of community. · A biotic community is an assemblage of populations living in a prescribed area or physical habitat. · It is the living part of the Ecosystem. · It is an organized unit. · A workable definition: “A group of individual organisms of one or more species growing in a specific area and having a natural interaction with one another and with other plants and animals”. · The communities often have a definite composition and structure. · Composition is due to because certain plants, insects, and animals are associated with one type of community. · The structure is due to the competition and dependence. · There are minor as well as major communities. The minor communities are those which are more or less dependent on neighboring aggregation. Major communities are those which are of sufficient size and completeness of organization that they are relatively independent. · No plant or animal lives as an isolated individual. · Plants and animals generally prefer to live in groups or colonies. · Different plant and animals living in a habitat are called PLANT COMMUNITY. · The basic unit of vegetation is called plant community or a plant association. · A group of individuals of the same species is commonly known as the population. Thus a population is a part of the community. · CLEMENTS original concept defined: “Community as any unit of vegetation, whether developmental or climax in status”. “The climatic climax community is in, complete equilibrium not only with climate also with the whole complex of the environment”. 1. Actually, it is a part of a larger whole Ecosystem in which living and non-living components interact and bring about circulation, transformation, and accumulation of energy and matter. Each species of the community has got a definite range of tolerance towards the physical and biological environmental conditions of the habitat. The range of environment a species can tolerate is called its Ecological AMPLITUDE. 2. Species occurring in the particular habitat do not live in complete isolation as pure cultures, but they coexist in mutual adjustment. The coexisting populations are interrelated and they show some sots of interaction. 3. All the members of a community have the ability to live under the conditions of the habitat and they are interdependent upon one another to some extent. It is called DEPENDENCY. e.g. i. Thallophytes, mosses, ferns and many shade-loving herbs that are found on the first floor are dependent on the FOREST TREES because tree provides shade and moist conditions. If the trees are removed, the ground vegetation may disappear. ii. similarly, the fungi and saprophytes found in the forest depend upon the roots of plants and Rich Humus and some fungi form Mycorrhiza association. iii. Some sort of relationship also exists between plants and the insects and other animals which pollinate them. 4. The commons species which are abundant and contain maximum biomass are considered to be Dominants. Dominants individuals influence the associated individuals. e.g. In the forest, tallest trees influence the understory plants and ground vegetation not only by decreasing the forest floor and increasing the moisture content of air but also changing the soil structure and its chemical composition. 5. In a plant community, the plants which have some sort of relationship among themselves may be Trees, Shrubs, Herbs, Mosses, Lichens, and Thallophytes. The plants form more or less distinct strata or layers or storey on vertical as well as horizontal planes. This is characteristically known as STRATIFICATION. 6. Interacting population of the community are characterized by continuous DEATH and REPLACEMENT and usually by immigration and emigration of their individuals. · In this way, composition and shape of the community remain in changing state. · The changes in the community go on taking place until a complete balance is established between community and environment. This is called SUCCESSION. · It completes equilibrium state a stable community is established which is called CLIMAX COMMUNITY. · In the climax community very little or no change in the shape can be anticipated over a long period of time. · The transition or marginal zone between two major communities presenting a situation of special ecological interest is called an ECOTONE or TENSION ZONE. · Strictly speaking a transition zone is an Ecotone only if tension exists between the bordering communities. · The Ecotone is colonized by the species that are commonly found in the communities on both the sides, as well as by some versatile species of plants and animals. i. T. Zone between grassland and Forests. ii. The intermediate zone between two major land or aquatic communities. 1. Tropical littoral and swamp forests. 2. Tropical dry deciduous forests. · The climate determines the TYPES of plans that can exist in each region. · General appearance of vegetation is referred to as PHYSIOGNOMY. It constituted general stature, shape, and life-forms of the species comprising the vegetation and actually, the classification of vegetation types has been done on the basis of physiognomy. · Evaluation of plant community on a BARE area is quite a prolonged process. · This involves a number of stages. · It is difficult to recognize these stages because of the fact that process of community evolution/development is continuous/Dynamic. · These stages can be defined on the basis of their characteristic vegetation. · The development of Bare areas is an initial prerequisite. · The naked areas develop either by Emersion, Submergence, Glacial Recession, Erosion, deposits and climatic change or by Biotic agencies. · Migrules means structures or offsprings reaching from different places. i. When the area becomes bare some plans from the nearby localities move into it in the form of germules, propagules, or migrules. This process is known as MIGRATION. ii. Migration starts when germules leave their parent area and terminate when they reach the final resting place. iii. The movement between these two places may complete in one or two steps. iv. It is only by migration plants from an area are brought into new areas. v. Several agencies help in the migration of plants to the new area. They are Wind, Water, Animals, man, Glacier etc. vi. Migrules may jump into the new areas, from all the surrounding localities or from one side only. · The phenomena of growth of propagules and their adjustment in the new surrounding is called ECESIS. · For success full establishment and development of the plant, growth processes should be unhampered. · If the Ecesis is to be a successful one, the seedling must grow, established successfully and reproduce in the neighboring habitat as well. · It is the processes of establishment of immigrants. · When the migrants enter a new area, they germinate, grow and reproduce there. · It is not necessary that all the migrules reaching the new the new areas must stabilize. The stabilization depends greatly on the conditions prevailing in the area. · The first plants growing in the new area are known as PIONEER COLONISERS. · The germination may be affected by a number of external and internal factors. · Dormancy may be a barrier to the germination. · Viviparous germination is helpful in the establishment of halophytes in the saline marshy plates as the saline habitat has marked inhibiting effect on germination. · In the beginning, pioneer plants may be present in very small number and they grow far from one another. These plants produce reproductive structures which will be dispersed in the open area around them and after germination, they form their family groups. · In the course of evolution more new migrlues reach the open areas and become stabilized there. · This group together of colonizing individuals in a bare area after the migration is termed as AGGREGATION. · The simple Aggregation is the grouping and growing of offsprings around the parent plant. · Mixed aggregation is due to the gradual spreading and intermingling of the neighboring plants, due to migration. · The simple and mixed aggregation results in competition. · The struggle for existence in the plant is between each plant and its habitat. · Competition always occur where two plants make a demand for light, nutrient or water in excess of the supply. It is the universal characteristics of all plant communities. · It increases with increase in population density. · It is acute within the individual or species which make similar demands upon the same supply at the same time is called INTRASPECIFIC competition. · When the competition is between different species it is called as INTERSPECIFIC competition. It is less severe due to their different requirements for Light, Nutrients, Water and Space. · When groups of seedlings, especially of the same species, are closely spaced competition begins immediately. · The larger plants get much light and carry an increased amount of photosynthesis in comparison to the shaded ones, as a result, the shaded plants do not develop properly and ultimately die. · In climax communities, every stratum and every kind of plants adjust themselves to the habitat and become interdependent upon each other. · All plants living in a climax community do not face any competition for food, water, space and air as the level of their supply in the soil is different. · A dominant plant does not compete with secondary dominate one, under shrubs herbs or ground flora, because each layer and each species have different requirements of Water, Light, Space, and Nutrients and with the passage of time each and every individual plant adjust themselves to the prevailing conditions. · Competition in-plant is through chemical warfare. In certain plants, chemicals liberated by one species affect other plants, due to Toxic effects. e.g. Encelia shrubs in California desert grow in microclimate but most of the shrubs do not grow under the above species. One species lives at the expense of another. One or both species benefit from the relationship but now suffers. The species live together in some measures of actuator potential competition for the same necessities such as Light, Moisture, Space and Nutrients. · In the process of colonization, germules of aggressive and more adapted plants reach the adjacent area from time to time. There they grow and become established. This process is termed as INVASION, and the new such organisms are called INVADERS. · Invasion may be intermittent (Periodic) or continuous. · The invaders establish themselves in the new area temporarily (Partial Invasion) or permanently (Permanent Invasion). · New invaders may come either from the adjacent areas or they come from the places in the same locality. Oceans, Lakes, Rivers, Deserts etc. 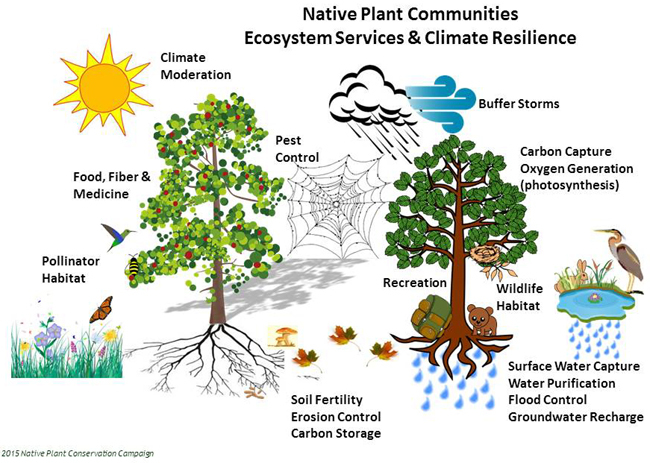 · When a plant community has adapted itself a habitat it exerts certain influences upon its surroundings this effect of plants on the habitat is known as REACTION. · Some reactions are a direct result of plant activities such as decrease of water by absorption and increase in humidity due to transpiration. · This is the effect of interaction between vegetation and habitat. (b) by modifying the climate. · The deed remains of colonizers are added to the soil in the form of humus. Humus changes the soil structure to a considerable extent. · Humus also increases the water holding capacity, aeration, and mineral of the soil. · Shadow of the plants checks the rise of temperature and increase the humidity in the air. · Reaction is a continuous process. · Reaction plays an important role if the replacement of pre-existing plants by the new Invaders. · Continuous competition and reaction bring about several marked changes in the environment and consequently introduce gradual change in the structure of vegetation. · After a long time, some such individuals come and dominate in the area as are least affected by the new changes in the habitat. · Climate at this stage plays the principal role in determining the nature of the community. This process is called STABILIZATION. · The final stage of vegetation development after the stabilization is called CLIMAX stage. · The dominant species of climax community are nearly in complete harmony with its habitat and environment. · Climax community is nearly stable and will not change so long as the climate and physiography remain the same. · However, a complete climax is impossible because the community and environment both are changing i.e. they are in a DYNAMIC state. (c) Species composition and dominance. Physiognomy refers to the general appearance of the plant community. Major plant communities of large area are classified into component communities o the basis of physiognomy. Component communities recognized o the basis of physiognomy is named after the dominant life form as e.g. Forest, Grassland, Desert Community. Major communities are sometimes divided into smaller segments on the basis of Habitat, mainly on the basis of water contents in the habitats. Major plant communities are often divided into smaller divisions on the basis of species composition and dominance. Such a classification requires the knowledge of species content of the community, frequency, dominance, and fidelity. If two areas have similar communities, the communities are named after dominant organisms or those showing high frequency. CLEMENT (1916) has put much emphasis on climate for the classification of communities and has based his classification up to three principles viz: Physiognomy, Dominance and Dynamic Relations of the community. Terms like association, consociation, fasciation, and society refer only to the climax communities. According to Clements, the major unit of vegetation is plant formation. Plant formation is a great vegetational unit in a region determined by several dominant growth forms. e.g. The forests which are characterized by trees plant formation is a product of macroclimate and is controlled and delimited by climate alone. The formation is a complex organism and as such it arises, grows, matures and reproduces. The mature vegetational unit which shows no sign of change in its climatic region is termed as CLIMAX Community and changing vegetational units are termed as SERAL Communities. e.g. These are characterized by trees. The forest may be deciduous, evergreen, high and low (mostly above 8 meters) tangled with lianas, heavy with epiphytes or sparse, long-lived and some rather short lived. They may harbor little undergrowth or a dense carpet of mosses. It is an open stand of trees which are as tall as trees growing in forests but scattered rather than clumped. It contains low, branched, often flat-topped small trees (less than 10 meters in height) and many other woody plants scattered regularly or assembled in small groves. The intervening spaces are often occupied by seasonal grasses (in tropics). It is an essentially continuous stand of medium-sized, compact growing, bushy plants separated by bare ground or herbaceous patches. It is a continuous stand of all dense grasses which are more than 50 cm high. They are usually seasonal in distribution. Besides grasses, very few shrubs may be present there. It is a continuous stand of herbaceous plants, the majority of them being graminoids. Meadows are devoid of woody vegetation. It is an open stand containing a bunch of grasses interspersed with low shrubs. Steppe and scrubs or steppe and meadow or even prairie differ each other in respect to the plant coverage. It is characterized by extremely low permanent coverage. The perennial vegetation is very sparse and during the rainy season, the ephemerals may cover the area. It consists of very low woody vegetation trailing shrubs and cushion plants intermingled with mosses. These are formed by Algae, Fungi, Lichens on the rocky surface or soils. It is the major subdivision of a formation. Every formation consists of two or more association. The number of associations is determined by the numbers of subclimates within the general climate of the formation. Each association has two or more dominant species. In moist temperate forests of Pakistan i.e. Moist Temperate coniferous forest formation we have several associations. Due to local factors such as soil Temperature rainfall etc every association may have several dominants. Sometimes it may be ten or more. Consociation is a small unit of a plant association characterized by a single dominant species. Therefore in one association, there may be several consociations, each dominated by a single species. e.g. ii. In plains of Pakistan at certain places, only Prosopis cineraria or Salvadora oleodies are dominant species. Some associations are often segregated on the basis of moisture relations and temperature into separate groups of two or more dominant species. Such subdivision of the association is called FACIATION. Among them, A. senga & E. caducifolia are found as dominant species which is termed as a FACIATION in the above-mentioned association. Society is a part of an association, consociation or faciation characterized by one or more subdominant species. Subdominants are species of low growth forms than the dominants. Thus in a forest, the subdominants are shrubs, herbs or cryptogams and in a grassland, they are herbs or low shrubs. The term society applies to ground flora communities their development and abundance are largely determined by the amount of available light and moisture. Different aspects of an association make their most vigorous growth and flowering at different periods. In societies, there are different layers of plants. A forest with a medium canopy may have five or six layers. The lowest and the first one is a ground community of mosses and Live worts, Liches and other fungi and usually some delicate annuals, then there are low medium and tall shrubs. Each of the layers is named according to the dominant species present. In each society, there may be found in two or more smallest units. These are called clans. Each clan is a small aggregation of single but very locally and overwhelmingly dominant species. · This term is used where the association is not a permanent one but is expected to be replaced by another in the process of development or succession. · The associes has dominant species of its own just as an association. · In certain seral communities single dominant may occur to form a CONSOCIES (development consociation). · This often happens when the habitat offers just the proper conditions for one species only or when the other seral dominants have failed to reach the area. · This is the sub-unit of the associes, as faciation is the subdivision of an association. ·, In this case, the dominant species is more than one and they are in developmental stages of succession. · It is the developmental community of an association, consociation or faciation, characterized by one or more subdominant species. · It may be (a) Layer socies or (b) Aspects socies, as the case may be. · The special field of synecology which is concerned with the structure and classification of plant community is known as PHYTOSOCIOLOGY. (a) QUALTATIVE characteristics are usually descriptive and are not measurable. (b) QUANTATIVE characteristics can be readily measured. (c) Synthetic characteristics include the generalization that are derived from the date of Analytic qualities and integrate many of the analytic characteristics. (d) PHYSIOGNOMIC characteristics include the general outline or Appearance of the stand of community. 1. Floristic composition or kinds of species. 3. Aspection or Periodicity or Phenology. · A complete list of species is essential for the study or stand. · The species content of a community can be studied by periodic collection and identification of plant species for the whole year. This will show the tolerance of each species for different environmental conditions. · In a community, plans occurring together having similar ecology occurs in a definite strata/layers, known as STRATIFICATION. · If one periodically observes the flora for the whole year, changes in the appearance of vegetation may be apparent with the change in the season. (This is known as section). · The size and number of these strata depend upon the kinds of life form present. · Stratification of the community develops because of differences in requirements of trees, shrubs, and herbs for light intensity, temperature, moisture condition and organic content of the soil and other factors. · The physiological requirements of species in different strata can be fully appreciated only when the stratification both above and below ground is worked out. e.g. · Most temperate Forest Communities are composed of at least 3-4 strata. The upper stratum consists of relatively large overstory trees, which dominants the community by shading, thus the VERTICAL structure is largely due to diminishing light and increasing humidity. It, therefore, determines the number of strata. · There is secondary understorey of these taller trees. These secondary storey trees are relatively tolerant to shading and normally do not grow nearly as tall as the dominants. Before the secondary trees will usually be one or more layers of herbaceous plants. · The seedlings and saplings of either the dominant or understorey species may appear in any of the lower strata, as they pass up on their way to maturity. · Some desert, Alpine or Grassland communities may have fewer strata or they may have all the strata on a miniature scale. · Tropical rainforest, on the other hand, are extremely complex, vertically and have live to seven strata. In these forests Epiphytes, Lianes and climbers are in abundance trying to reach the highest trees to obtain light. · Periodicity refers to the rhythmic phenomena related to the seasonal changes i.e. growth, flowering, pollination, the ripening of fruits and seeds as well as their dissemination. · Periodicity is controlled by a number of environmental factors such as light, temperature. · Small species require long and some short day. · Length of the day affects the time of flowering. · The fall of leaves in Autumn is a response to the length of the day. · During late winter or early spring plant begins to grow as soon as the temperature is moderate and if the temperature is very high or very low, the plants will cease it active growth. · PHENOLOGY refers to the appearance of various plants at different seasons of the year. · ASPECTION is the phonological appearance or aspect of the community as a whole at different seasons of the year. · When a species or group of species appears to be dominant for a season of the year, it is known as seasonal or aspect dominance. · All the phenological phases of plants such as leaf period, shot period etc are of equal importance to the plant community. · These phonological phases are rarely strictly coinciding some are in vegetative phase, other are in flowering and fruiting phase. · It relates to the condition of a plant and its capacity to complete the life cycle. · Some species in communities are of a low vitality to complete the life cycle. · Some species in communities are of low vitality in the sense that they remain vegetative, being unable to flower and set seed. · Vigour, refers especially to the state or development of seedling or mature plant. · Plant may be vigorously growing or it may be weak and its rate of development may be poor. · There is a number of critics to determine the vigour of the plants such as the rapidity of growth, rate and amount of leaves, shoots, and roots livid susceptibility to disease or damage. CLASS I: Well developed plants, which regularly complete the life cycle. Class II: Vigorous plants which usually do not complete their life cycle or are poorly developed and sparsely distributed or plants that spread vegetatively. CLASS III: Feeble plants that never complete the life cycle but spread vegetatively. CLASS IV: Plants occasionally appearing from seeds but which do not increase in numbers such as Ephemeral plants. · Sociability or gregariousness refers to the degree to which the plants are aggregated in nature. · It is dependent upon the life-form mode of reproduction, vigour of the plants, habitat conditions, competition, and their relations between individuals. CLASS II: Plants growing in small groups. CLASS III: Small scattered patches or cushions. CLASS IV: Large patches, broken mats or small colonies. CLASS V: Very large mats or stands (Pure populations) that almost cover a large area. · Sociability is not a constant feature. At one time a plant would come in class I and at other time it can come in Class V.
· The quantitative characteristics are those that can readily be measured. · It consists of density, cover, and frequency. · It refers to the number of individual of a species counted on a unit area. Total No. of sample plots studied. · It is the proportion of a density of a species to that of a stand as a whole. · Density shows the numerical strength of the species. · Cover indicates the ground covered or shaded by the above-ground parts of the plant. · Coverage values are the rough measures of the degree of dominance of a species in its layer. Each layer is considered separately. · BASA AREA refers to the ground actually covered by the crown only. · In forest basal area is the cross-section area of a tree measured at 4.5 feet above the ground. In herbaceous vegetation basal area refers to the coverage of plant one inch above the ground surface. In order to obtain the cover, the diameter of the crown is taken with the help of measuring tape. · Relative cover of a species is the proportion of the total of a species to the sum of the cover of all the plants of all species in the area. · The above-mentioned cover classes can also be used for rapid estimation of the covered area of the species. · It is a percentage of sampling plots in which a given species occurs. · It is connected with the degree of uniformity of occurrence of individuals of a species within an area. · In a sample area frequency is measured by noting only the name not the number of the species present. · It is the proportion of the total frequency of a species to the sun of the frequency of all the species in the area. · It has been estimated that in comities most of the plants belong to frequency class A while B&C are represented by lesser number of species Class D is represented the greater, equal or lesser number of species than C while Class E has smallest number of species. · Vegetation extending over a vast piece of land shows marked zonation in its floristic and composition both Horizontally and well as vertically. · Horizontally a forest community is divisible into as many parts as there are variants in climate and soil. e.g. Riverain Forest (in Sindh) starting from the bank of the Indus River to the farthest driest end there is a clear gradient of soil water. The vegetation similarly shows a zone of distinct species along this gradient. · He deciding factor in this type of zonation are temperature and precipitation along rising mountains. · The foothills will have the zone of those species which are accustomed to less rainfall but comparatively high temperature. · The two adjacent zones never meet abruptly but they always contain a transitionary zone with a mixture of species belonging to the two adjacent zone. This transitional belt is called ACOTONE. · A transect is a long rectangular sample plot. · It is also called as LINE INTERCEPT method, in which the plant species are recorded as they occur along a line. · It is particularly useful in dense stands of scrubby vegetation, which would be difficult to sample. · This method is rapid and give accurate information of the vegetation. · It was introduced by CANFIELD (1941). · This method of vegetational sampling is very good for forest, shrubs or present in the transect can be done by this method. · It is actually an improvement of the line transect method. · This sampling method requires ordinary measuring Tape, Nails and a Rod of Ten fell and nine inches in length. · From the starting point, a line which is 200 feet long is drawn with help of a measuring Tape and stalked firmly in an area under consideration. · From either side of this line strip an area of 10′ – 9″ is marked out with the help of a Rod so as to made a transect of 200′ x 21′ x 6″. · In this transect, all the species that are intercepted are recorded and its crown cover was taken by sighting a long stick in such a way that the stick is as per particular position and the upper end of the stick is facing the periphery of the crown and another end is pointing the ground. · Now the stick is moved downward, so that it may touch the ground. · Distance from this point to the Trunk of the tree is taken, which gives us the radius of the circle. · The circumference can be calculated and covered into cover by the help of conversion table. · In this method, the aim is to show the vertical distribution of plants or profile of vegetation, which may include all the strata or layers of the community, from dominant trees, shrubs, herbs, climbers as well as the ground flora. · It is equally essential to understand the relative position, depth and extent of underground parts such as Rhizomes, Bulb, Tuber, as well as the roots of each plant are to be studied and their relative position and extent carefully measured. · It can be done by digging a trench in the community to a depth greater than that of the deepest root system. · Graphically reproduced, profiles may be useful for moving comparison between stands and for interpreting community dynamics. · Knowledge of the of parts of below ground particularly with respect to soil profile and in physical characteristics and moisture relations can be very valuable for competitive abilities of species. · The quadrat is a square sample plot or unit for a detailed analysis of vegetation. · It is actually the sample plot method of CLEMENTS (1898). · It may be a single sample plot or may be divided into several subplots. · In a vegetational analysis, quadrants of any size, shape, number, and arrangement may be used. · In the study of a forest community quadrats of ONE-FIFTH acre are established to include a maximum number of trees, while for studying shrubs and grass covers usually the quadrats of smaller sizes are used. · For grassland and low herbaceous community, the quadrants of one square meter size or 50 cm x 50 cm size or even 20 cm x 20 cm size may serve the purpose. · The shape of quadrat is usually a square but rectangular or even circular ones are also used. · In some cases, rectangular sample plots often gave the best results. Rectangular plots is generally 1 : 2 or 1 : 4 or 1 : 8. · When the organisms encountered in the sample plot are listed by their names, the quadrat is called list quadrat. · It includes all the species botanically identified or otherwise. · A series of list quadrats gives the floristic analysis of the community. · This is used for studying the frequency of different species. · When the species name and the number of individuals of each species found in the sample area are recorded, the sample plot is called count or list-count quadrat. · This type of plot is usually used in forest survey work. · When the actual or relative coverage is recorded usually a percentage of ground area covered or shaded by vegetation, the sample area is known as COVER QUADRAT. · Quadrats that are mapped to scales to show the location of individuals of species are called CHART QUADRATS. · Individuals plant is recorded on miniature quadrat on a graph paper often with the help of an instrument called PLANTOGRAPH. · This is very tedious work but where long-range studies of vegetation changes are being made, this method provides a big picture. Statistically reliable estimates are obtained by randomized plots. · Synthetic characteristics are a generalization that is derived from data on analytic qualities and integrates many of the analytic characteristics. · The term fidelity refers to the faithfulness, of a species to its community. · In the community, there are different types of species. · Some plants species are confined to one particular community and they are called INDICATOR SPECIES. · Some can flourish in several comities. · According to HANSON (1950) it is a measure of ecological amplitude. · PANDEYA (1960) observe that characteristics species with high fidelity value has low ecological amplitude. · Ecological Amplitude of a species or its tolerance (Good 1947) is the capacity of growing and reproducing within a certain range of environmental conditions. · Fidelity of a species is expressed in relation to a particular community. · A species may have high fidelity for one community and a low fidelity for another. Which are either intruder from other community or Relics from other successional stages. INDIFFERENT SPECIES or companions which have no preference or affinities for any community. Which may be found in several communities but have an affinity for only one community. Which may occur rarely in other communities but have a strong affinity to one particular community. Which occur exclusively or almost exclusively in one community. · It indicates the presence of a species in a stand. · It is generally expressed in a scale of 1 to 5. Which occur in 1% to 20% of sand examined. Which occur in 21% to 40% of stand examined. Which occur in 41% to 60% of stand examined. Which occur in 60% to 80% of stand examined. Which occur in 81% to 100% stand examined. · It is the degree of “PRESENCE” in a unit area (Sample Area) instead of the whole stand. · It actually improves the method of present study, otherwise there is no fundamental difference between presence and Constance. · It is generally determined by the frequency and the following constancy classes have been recognized. · It is the appearance of a stand. · It may be considered a synthetic quality because the appearance of vegetation is based on a number of qualitative and quantitative characteristics. · Physiognomy is also useful in the broad and general description of vegetation. · Pattern is the group of individuals with physiognomic contrast, such as shrubs in a grassland or vegetational zones around a lake. · Some of the cause of pattern may be vegetative-reproductive organs (such as Rhizomes) competition, an association of species, variation in soil moisture, the concentration of nutrients, soil texture and structure etc. · The characteristic vegetative appearance of the plant body and its longevity is known as LIFE-FORM. · The general appearance of a community is caused more by the life-form of the most abundant or dominant species, than by another characteristic of the vegetation. · RAUNKER (1934) devised a system of classification of life-form on the basis of perennating buds, which carry the plants through the unfavorable seasons of the year. · Trees with resting buds carried high above the ground is regarded as most primitive life-form. · Adaptation to winter climates or dry seasons of varying severity is achieved by life-form in which the perennating buds are borne closer o the ground or actually buried in the soil. · The extreme case is represented by annuals which survive only in the highly resistant form of dormant seeds. · PAUNKIAAR’S classified consists of following five principles of life-form class based on increased protection of the perennating buds i.e. · There is a consistent variation of leaf, leaf size and texture between individual plant communities, these leaf characteristics also differ with various climatic conditions. · Therefore leaf shape and size is considered to be an important physiognomic characteristic. and then assigned size classed by calculating the size of the leaves. · The lower limit of the size class is 25 mm and succeeding classes are associated by considering them to be nine larger than the last one. · These size proportion can certainly be related to the environment and later to the understanding of the physiological process in the plant communities. i. Forest Fires usually break out during hot and dry summer and Autumn months. iv. Rifle shots during the celebration. v. The cross-border fire e.g. In 1998 fire affected 51,639 Hectare or 9.1% of the total forest area in A.J.K. vi. Forest fires are frequent in Pakistan about 50,000 Hectare of forest are affected annually.